Those times when swimming pools were only associated with the rich and powerful are long gone. Nowadays, irrespective of whether they have a low or medium household budget, people can afford to get a swimming pool where they can enjoy hours of fun throughout the entire summer. By investing in an above ground pool, you can be certain that gatherings, picnics and backyard parties will not have to always be away from your home. Not to mention the fact that you will be saving some cash as well, considering that you no longer have to travel for miles in order to enjoy the sunny beach. Meet the Intex 18ft X 48in Easy Set Pool Set, a rather large and convenient swimming pool that will make your summer dreams come true. Available at an incredible price and incorporating most of the accessories you will ever need to have fun around the pool, this amazing pool is definitely worth your attention. 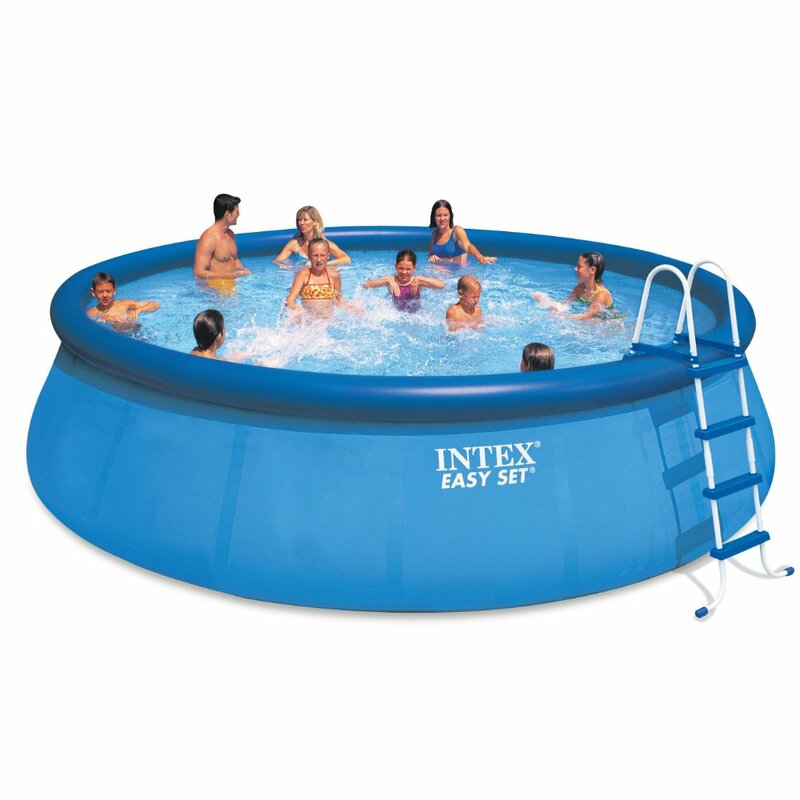 The Intex Easy Set Pool has a good reputation among customers who have rated it quite highly on most specialty websites (four out of five stars). While most users appreciate the fact that this Intex model is well made and overall durable, some of them reported they had some issues with the top ring. In short, the pool developed leaks pretty soon; but we will get to that in a moment. After you made a decision regarding the location of your above ground swimming pool, clean the area so that it is even and spread out the pool. Inflate the top edges (the blue navy rim). Connect the water hose and fill the pool with water (don’ t forget to check on it from time to time). Disconnect the water hose when the pool is full (usually when you notice the rims float up with the water) and enjoy your swim. The manufacturer recommends the ring inflation as the next step to take after you have prepared the liner. To summarize, you are advised to spread the ring outside of the wall lining and make sure it is facing upwards before you fill it up with an air pump. In regard to the air pump, it is important that you stay clear of high-pressure pumps or air compressors in order to prevent the bursting and over inflation. Essentially, the best tool for this task is a manual inflation hand pump. When filling the pool’s ring with air, it is necessary that you account for the air temperatures proprietary to your geographic location. In the eventuality that you experience very hot summers in your region, then it is best to refrain from filling the ring to full. Moreover, during torrid days, it is always a good idea to release some of the air as well. High temperatures will inevitably determine the air inside the ring to expand and consequentially cause damage to materials. Make sure you follow the manufacturer’s instruction when you are cleaning the top ring (you can find them in the DVD included in the package). Ideally, the ring should be wiped clean with a damp and soft piece of cloth after each use to avoid the appearance of difficult stains. At the same time, covering the pool when it is not in use is a surefire way of prolonging its lifespan. In the eventuality that you notice dark stains on the ring, then use a damp cloth with mild detergent to gently rub them out. Brushes, strong detergents and abrasive materials are out of the question because they can damage the top ring. Highly affordable, suitable for most backyards and very easy to set up (does not require advanced mechanical knowledge), the Intex Easy Set Pool Package is just the thing you need to beat the exhausting summer heat. Furthermore, given the fact that it contains its own saltwater system, this Intex pool will not necessitate a lot of maintenance either. The bottom line is that this pool is perfect for families with a low household budget who simply want to have a place to escape the torrid summer days and have some fun at the same time.